Department of Social and Governance Policy Research, Nigeria Institute of Social and Economic Research (NISER), Ojoo, Ibadan, Nigeria. *To whom correspondence should be addressed. E-mail: inofitshout@yahoo.com. Sustainable development, Goals, Environmental education, Nigeria. On September 25, 2015, the United Nation General Assembly adopted the 2030 Agenda for sustainable development. At the core of the 2030 Agenda are 17 sustainable development goals (SDGs). While the SDGs covered three domains of economic, social and environment in its 17 goals, it is instructive to note that 10 out of the 17 goals are directly or indirectly linked to the environment suggesting the importance of the environment in achieving the SDGs. Therefore, to achieve the SDGs, individuals and communities need to be equipped with relevant environment knowledge, skills, values and attitudes that empower them to contribute to sustainable development. Environmental education therefore becomes crucial for the achievement of SDGs. While Nigeria has realized the importance of environmental education, the resultant implementation of environmental education in Nigeria is not encouraging as manifested by the declining Environmental Performance Indicators (EPI) since 2012. 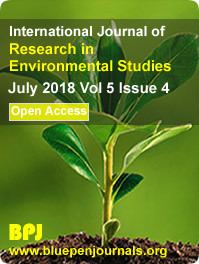 This study examined the prospects and challenges of environmental education in Nigeria with a view to proffering strategies for increasing environmental education in Nigeria. The above was achieved using historical and desk-based research design. It involved content analysis of existing literature to help situate the current study within the context of existing evidence. Findings identified interdisciplinary nature of environmental education, shortage of trained teachers, high illiteracy level among the population, poverty among others as the challenges of environmental education in Nigeria. The study calls for training of environmental education teachers at all levels of education and designing of special informal environmental education awareness programmes and campaigns in Nigeria.